It’s about time you learn about thyme! As a nutrient-dense herb with so many impressive health benefits, it’s hard not to add sprigs to recipes. Thyme has been praised in the natural medicine world for years, specifically due to it’s volatile oils, such as thymol. Thymol has been connected to increasing healthy fats (such as DHA) in cell membranes and structures, as well as having strong antimicrobial properties. Consequently, thyme has been documented as a natural food preservative and is thought to help decontaminate food and protect you from food-borne illnesses. Plus, did you know, that back in Medieval Times, women would give their knights a scarf with a sprig of thyme in it as a symbol of bravery? So cool for a little herb... no?? The ancient Egyptians used thyme as an embalming agent (thanks to its essential oils) to preserve their mummified pharaohs. So many people have the habit of throwing away this garnish or putting it off to the side of their plate, thinking that this insignificant green is not worth anyone’s time or energy. But in fact, you are lessening the nutritional qualities of your dish by doing so. Parsley is not insignificant and deserves your devoted attention! Here’s why… Parsley is a great source of vitamin K, C, and A, folate, iron, folic acid, and chlorophyll. These great nutrients provide the usual leafy green benefits – anti-cancer, anti-inflammatory, immune boosting, and blood purifying properties, but there is also something a bit unusual about parsley … its essential volatile oil components, like myristicin, provide even stronger cancer fighting and detoxifying benefits. Specifically, parsley’s myristicin is known to activate an important detoxifying enzyme, glutathione-S-transferase, which helps effectively conjugate and eliminate toxins from the body before damage is done. Now, that’s pretty impressive for a garnish that is so often ignored. Vitamin K, vitamin C, vitamin A, folate, iron, calcium, potassium, magnesium, phosphorus, copper, zinc, manganese, myristicin, flavonoids, and folic acid. Parsley is a great natural “mint” – thanks to its antibacterial properties, you can chew on its leaves to get rid of bad breath. Oregano, a nutrient-dense spice known for its volatile oils - thymol and carvacrol - which have been shown to exhibit antibacterial properties. Specifically, inhibiting growth of Pseudomonas aeruginosa and Staphylococcus aureus. Cool right?!? Oregano is also rich in other antioxidant phytonutrients - providing anti-inflammatory and oxidative stress fighting properties! 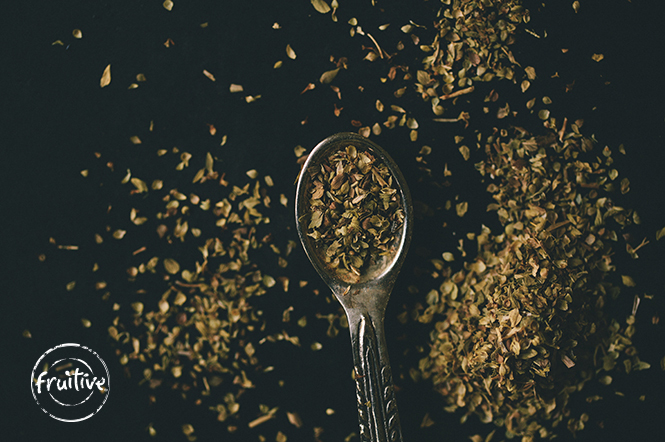 Oregano became popular in the U.S. when World War II soldiers returned from Italy with this "pizza spice." Looking to soothe your stomach and GI tract with one simple ingredient? Mint may be your answer. Mint has been used as a natural stomach remedy for centuries and with good reason. Mint’s special compound, menthol, helps effectively relax smooth muscle found in the stomach and GI tract, thus, ultimately relaxing an upset stomach in a clean, natural way. Not to mention, mint’s essential oils provide even more anti-inflammatory properties. Mint can be the new natural cramp and gas pain remedy you share with all your friends and family! They’ll love you for it! Vitamin A, beta-carotene, manganese, iron, folate, vitamin C, rosmarinic acid, fiber, magnesium, calcium, omega-3 fatty acids, and potassium. Mint is named after the Greek mythical character, Minthe. The story goes, Hades fell in love with Minthe, the water nymph, and Hades’ revenge-driven wife turned Minthe into a plant. Unable to reverse the spell, Hades gave plant Minthe a delightful aroma, ultimately, turning her into mint! Cilantro has a strong, fantastic flavor and a very rich aroma. It adds just the right amount of kick to any recipe. Plus, it is phytonutrient dense and helps to fight off the common food-borne bacteria, Salmonella. Yes, that’s right! Cilantro’s antibiotic compound, dodecenal, kills off Salmonella. In fact, dodecenal has such strong antibiotic properties that scientists have thought of isolating it from cilantro to be used as a tasteless food additive to prevent Salmonella poisoning. So, the next time you’re at the State Fair and feel a bit uneasy about the food handling, try to find something with fresh cilantro or bring some along with you to add to your questionable food option! Or better yet, carry an All Greens cold-pressed juice with you for prepaid cilantro access. Fiber, calcium, magnesium, iron, potassium, volatile oils, flavonoids, phenolic acid, vitamin A, vitamin C, vitamin K, traces of B-complex vitamins, and omega-3 and omega-6 fatty acids. Cilantro is often paired with Latin, Indian, and Asian cuisine due to its citrus-like flavor that helps balance out the heat of spicy dishes. Bay leaves, often used in Indian and Mediterranean cuisine, provide great flavor to many dishes! But that's not all it provides. As a nutrient dense herb, it also has antimicrobial, diuretic, and astringent properties. Now, that’s pretty cool for a leaf! Thought to be a natural ant repellent... but we haven't tried it yet! Have you? From being a symbol of hospitality in India to a symbol of love in Italy, basil has long been an herb prized by many cultures. Derived from the Greek word meaning "royal," it's obvious that even ancient cultures thought that basil was… well… royal. Today we see it as a seasoning, but it's so much more. Basil is actually very nutrient dense and has strong antimicrobial, anti-inflammatory, and cancer fighting benefits. It may also help treat arthritis and ease inflammatory bowel symptoms. Now, that's what it takes to be true royalty! vitamin K, BCP (E-beta-caryophyllene), iron, vitamin A, fiber, vitamin C, magnesium, manganese, vitamin B6, potassium, calcium, and flavonoids and other phytonutrient antioxidants. Basil is a must-have for your home garden! Interestingly enough, planting basil in your home garden may actually boost the flavor and production of many garden plants, including the tomato and pepper plant. Not to mention, basil also has natural pest repelling properties, making it the perfect organic home-garden pesticide.